Most companies looking to build a successful online presence must rely heavily on search engines to drive customer traffic. In a perfect world, though, this is not what most marketers would want since they do not have complete control over an important method for acquiring customers. But as things currently stand, performing well on search engine queries is vital and marketers have little choice but to deal with it by developing a search engine marketing strategy. And what does it mean to have a successful search engine marketing strategy? The best measure of success is high visibility on the list of links returned to someone’s keyword search (called organic search results). Yet, what many marketers, especially those in small firms, do not realize is that gaining high rankings is not easy. It takes work and it takes understanding how search engines operate. While a few years ago understanding the basic workings of search engines was not all that difficult, things have become much more complicated for two key reasons. First, search engines have evolved to become the de facto gatekeeper to the web as the majority of Internet surfers go there first when looking for information. In fact, a search engine is often the default start page when a web browser is first loaded. Second, over time many web marketers have come to understand the ins-and-outs of how search engines rank websites and they have developed their own business of selling this information to others. These search engine consultants offer services that use methods they say will optimize a website and improve its search engine rankings. 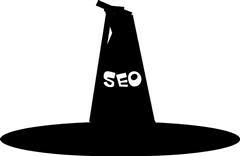 The services to improve search engine rankings fall into two camps: white hats and black hats. The white hats essentially optimize a website by following rules laid out by search engines. Unfortunately, while these may improve the rankings, the time frame for improvement could be long term and may not necessarily result in the website getting into the first 10 listings, which is often a key goal. Black hats, on the other hand, look for methods that will propel a website’s rankings more quickly. However, some of these methods go against the requirements laid out by search engines. If the methods used by black hats are identified as being inappropriate, a search engine may penalize the website by dropping it in the rankings or removing its listing all together. As discussed in this story, retailer JCPenney’s website has been flagged by Google as not playing by the rules. Google claims black-hat techniques were used to fool Google into thinking the JCPenney website was relevant for a large number of search terms. During a four-month period that included the holiday selling season, these techniques helped JCPenney leap to the top of Google rankings for a large number of search terms. Google has responded by penalizing JCPenney including wiping them off the first page of search results for most terms. Is it possible unethical competitors can undertake activity to scam search engines in ways that are intended to negatively impact another company’s website?